The Ultimate Pontiac GTO Picture Site By Sean Mattingly. There's no bigger GTO image collection anywhere! Released 6/6/03 from GM's media website. Photos courtesy of GM and the GTOAA. 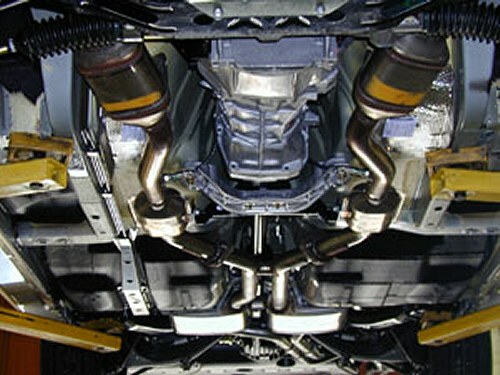 DETROIT, MI, June 6, 2003 - A combination of high-technology refinement, global engineering and good old-fashioned ear tuning has ensured the dual exhaust system of the 2004 Pontiac GTO produces a legendary sound in a contemporary car - a rumbling, throaty exhaust note reminiscent of the classic original. Mechanically, the exhaust system on the GTO consists of two completely independent exhaust paths that run from the manifolds to the outlet pipes, ensuring there is no mixture of exhaust gases. However, creating the necessary "voice" of the vehicle required much more than simple mechanics. The two exhaust outlets are side-by-side. 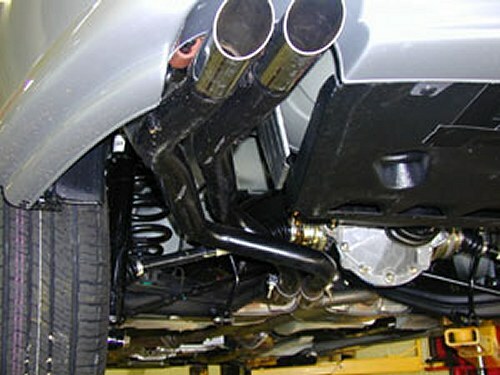 But the system is a true dual exhaust system all the way. "Anyone who has ever heard a classic GTO knows that distinctive 'sound,'" said Lynn Myers, Pontiac-GMC general manager. "It's very much a part of the character of both the GTO and Pontiac, so we knew we had to recreate that same feeling in the modern version." The Holden Monaro, on which the new GTO is based, didn't have the "sound" Pontiac needed. "The Monaro is a great performance car, but it's sold as more of a luxury vehicle in Australia so the exhaust note was fairly quiet," said Robert Kraut, GTO marketing director. "From the beginning, everyone knew that the exhaust would have to be 'dialed-up' to give us that special sensory cue that says, 'This is a Pontiac.'" new GTO carried all of the audible emotion and virtues associated with its legendary predecessor. "We had three main priorities for this vehicle right from the outset: power, launch feel, and an exhaust note with lots of character,"
explained Dave Himmelberg, the GTO program engineering manager. "Our sound objective wasn't about making the exhaust loud. It was about bringing a smile to someone's face as soon as they turned the key." Early in the vehicle development process, engineers test-drove an original 1964 GTO on loan from the Pontiac historical collection to acquaint themselves with its acoustical traits. "We wanted to get a real good feel for the sound character of the vehicle," Himmelberg explained, "and that drive provided us with an acoustical baseline from which to start." 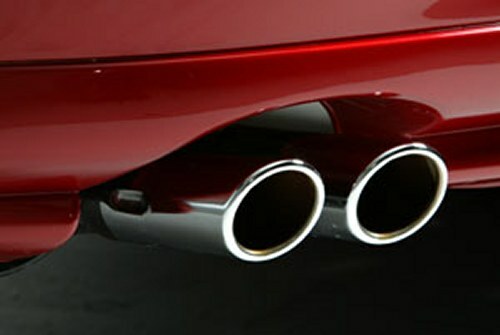 develop an exhaust system that delivered the desired sound and performance characteristics. to the spirit of an American classic," Himmelberg said. Dave Himmelberg, GTO Project Engineering Manager, shows an illustration of the system. A single tubular brace that holds the paths together between the converters and resonators to minimize vibration that could adversely affect the tonal qualities of the system. Using advanced exhaust modeling capabilities, literally dozens of math-based models were analyzed during system development to refine exhaust flow and detail paths in various components for desired tonal qualities. at start up, more of a throaty roar during acceleration, and it needed to have a pleasing presence at cruise speeds." However, the true test came down to what the exhaust note sounded like to the human ear, and the emotions it evoked. A Quicksilver Metallic prototype car with the duals installed. streets, pass-by on highways, idle . . . you name it." Another view of a prototype car with duals installed. "In the end, we knew we had exactly the sound we wanted. It's hard to hear it and not just grin." manufacturing operations in 32 countries and its vehicles are sold in more than 190 countries. In 2002, GM sold more than 8.6 million cars and trucks, nearly 15 percent of the global vehicle market. GM's global headquarters is at the GM Renaissance Center in Detroit. 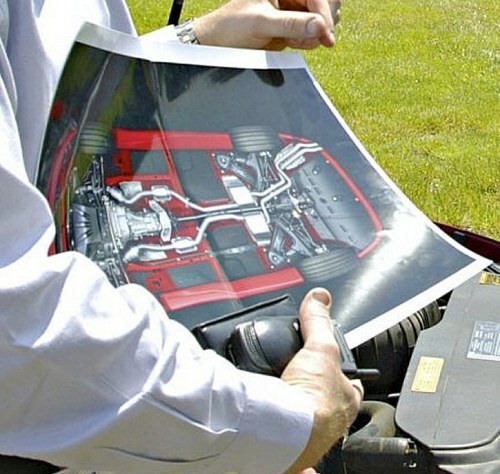 More information on GM and its products can be found on the company's consumer website at www.gm.com. Look for sound samples of the car to appear here soon. There will be some .WAV files to hear or download. Go bookmark the main GTO section to see All the latest changes. Send Sean some positive comments, GTO pictures, or flames. Says Dan Garcia (dag53_@.hotmail.com) - "I visit all the time to look at pictures, read articles and look for ways to improve my GTO."